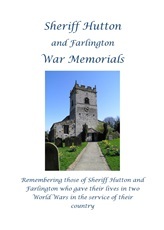 Sheriff Hutton and Farlington War Memorials - researched by Neil Hodges. The men and women of Sheriff Hutton who gave their lives in two World Wars. War Memorials - Our project is to research, where possible, the lives and families of the men and women whose names appear on War Memorials in the Ryedale area.